As the most wonderful and joyous time of the year approaches, it’s time to decide where you and the family will be having Christmas dinner. Instead of fretting over which restaurant you should go to, we’ve compiled a list of scrumptious offerings that will satisfy the whole family! 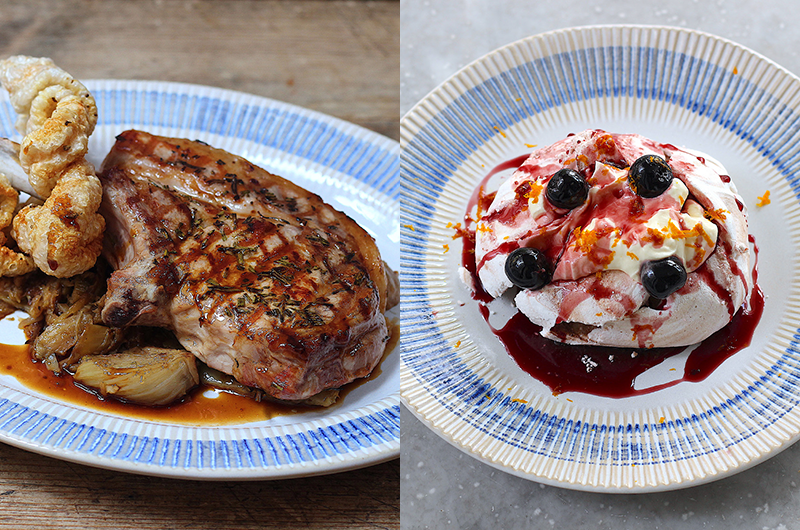 Indulge in a Christmas feast in the comfort of your own home! Be it a party or a family dinner, let Bakerzin take care of your meal through it’s a-la-carte menu and festive packages, which serves up to eight people. Begin your meal with the Orange Cinnamon Capon ($49) that has been slow-roasted to perfection, and marinated overnight in a medley of rosemary, thyme, cinnamon stick and garlic. Packed with a generous serving of sautéed carrots and baby potatoes; you’re sure to enjoy a delicious main course with abundant fragrance and flavours. 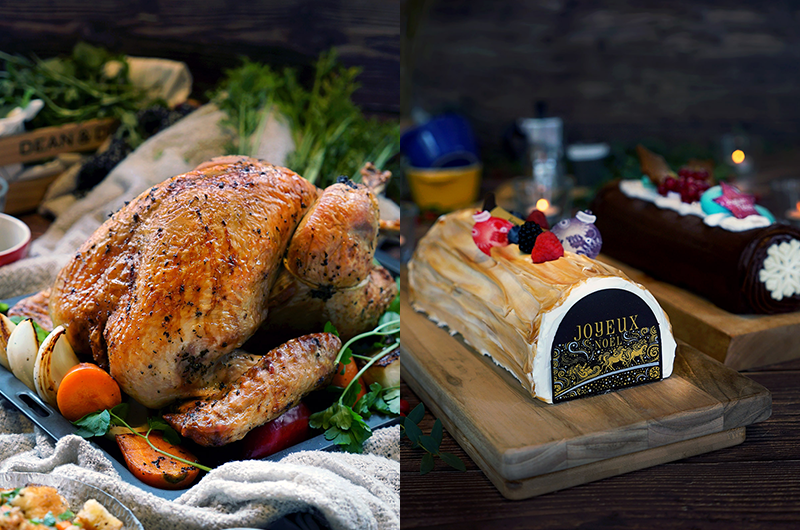 For dessert, take your pick from the stunning array of Christmas Cakes available which includes the iconic flourless log cake Chocolat De Beau ($54) and perennial favourite, Aged Fruit Cake with Yuzu Frosting ($48). Available for pre-order at: All Bakerzin outlets, Raffles Xchange Push Cart @ Raffles Place and online here. List of outlets available here. Click here for more information. 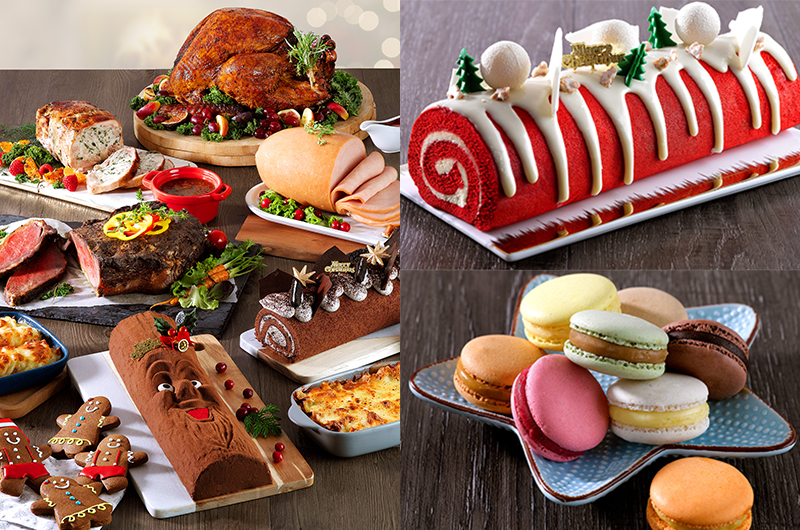 Christmas parties have been made easier to plan with the variety of log cakes, roasts and goodies available from Delifrance! 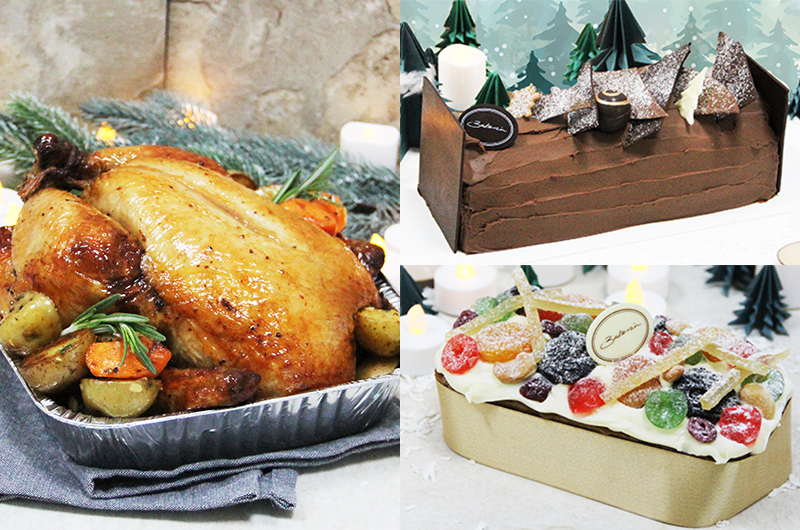 The menu includes the flavourful Traditional Roasted Turkey ($128) which comes with savoury brown sauce and cranberry sauce, as well as the best-selling sweet and velvety Valrhona chocolate cake, Joy of Delifrance ($68). 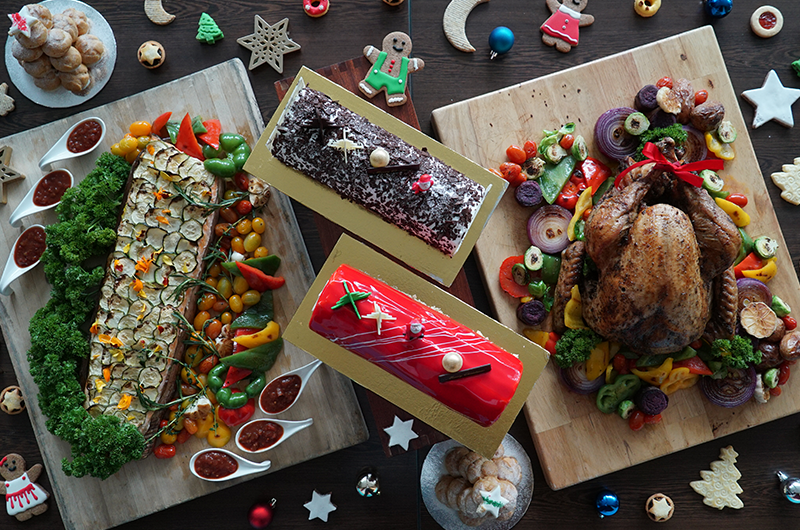 Plus, enjoy a scrumptious in-house Christmas menu when you visit any Delifrance outlet during your holiday shopping! Tuck into the Santa Baked Chicken; which is a hearty combination of succulent baked chicken thigh drizzled in the Chef’s special sauce, baked potato, fresh mesclun salad, cherry tomatoes and honey mustard sauce or, try the flavourful Beef Goulash that is packed within a crusty puff pastry shell. Remember to end off your meal with a beautiful slice of their all new moist red velvet log cake! Available for pre-order at: All Delifrance outlets and online here. 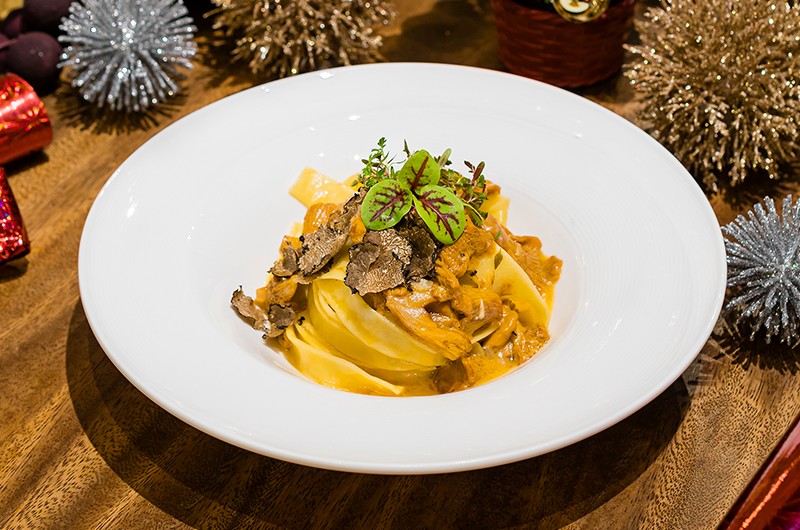 If you’re looking for an Italian meal this Christmas, head down to Jamie’s Italian at VivoCity or Forum for a mouthwatering fare. 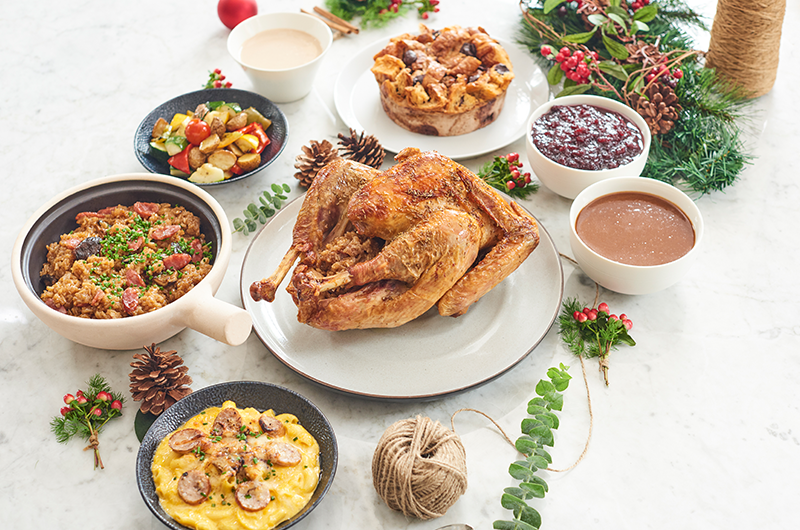 At the VivoCity branch, enjoy the Christmas Day Lunch Semi-buffet which features a spread of hot and cold starters, side dishes, salads and desserts. Pastas and pizzas will be passed around the table, just like in Italian family trattorias, while main courses will be served separately. 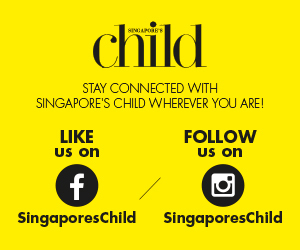 Plus, children will get to enjoy a line-up of fun activities while the adults get entertained with live music! Over at the Forum branch, look forward to a sumptuous four-course Christmas Day Set Lunch that includes Gennaro’s turkey ravioli inspired by Jamie’s mentor, Gennaro Contaldo; a wide selection of meats made with higher-welfare pork and fennel and the crowd-pleasing Christmas pavlova with whipped vanilla crème fraiche, cherries and orange zest for dessert. Experience festive cheer at The Marmalade Pantry with two set menus that offer a range of classic and wholesome choices of starters, mains and desserts. From the comforting Vanilla Butternut Soup with a delicate ricotta cheese ravioli to traditional favourites such as the Turkey Breast with traditional stuffing, cranberry sauce, sherry dressing and mesclun salad; there’s something for everyone in the family. If you’re looking for merry festive feasts to serve at a gathering, you’re in luck! 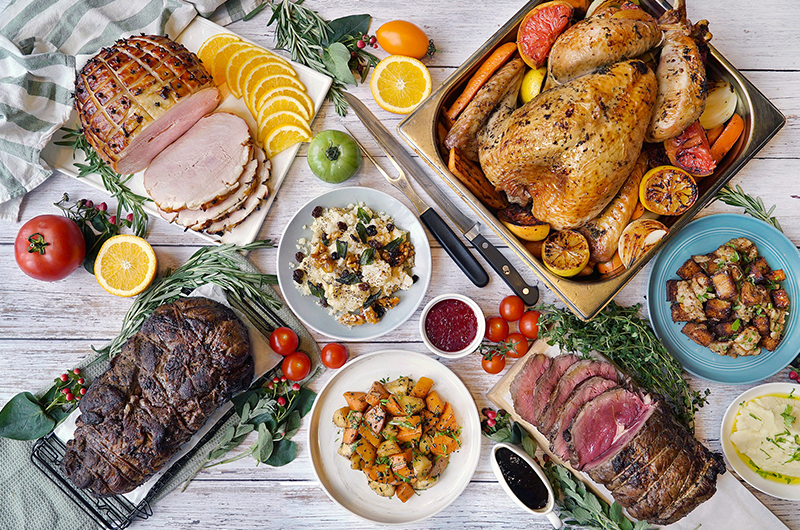 The Marmalade Pantry also offers home festive bundles that includes one carvery item and two sides for $110 with the option for home delivery, or self pick-up. Festive bundles available for pre-order at: The Marmalade Pantry Downtown, The Marmalade Pantry Novena and online here. Luxuriate in an Italian-style Christmas at Sinfonia Ristorante with festive seasonal set menus and a free-flow Christmas Special alongside live stations and assorted dessert tables! Dine under high ceilings and Corinthian columns with an array of festive dishes like the Roasted Turkey ‘Etruscan’ style, Sardinian Gnocchi, Pecorino Cheese, Venison Ragout and the Truffle Risotto with Parmesan Cheese which have been specially curated by Head Chef, Simone Depalmas. 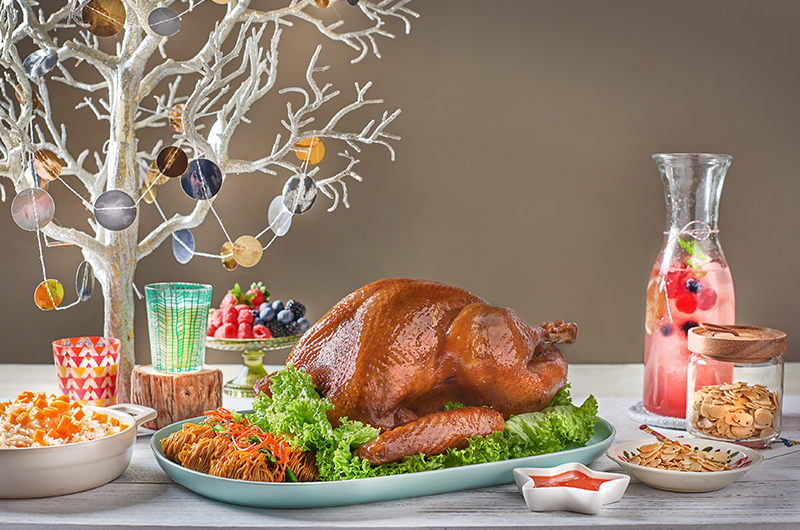 Celebrate good times with lavish festive dishes from Earle Swensen’s that are fit for the season. From now to 31 December, enjoy an elevated dining experience with two Christmas specials, Jolly Good Platter ($25.90) and Santa’s Catch ($26.90), where premium seafood and meats are charbroiled to perfection. Complete the meal with Merry Berry ($6.50), which is a dazzling concoction of fizzy soda infused with strawberry and blueberries, and topped with a rosemary sprig. Change up your Christmas gathering with an Asian twist! Known for creating outstanding Christmas feasts with its signature Asian flair, Goodwood Park has upped their festive meal offerings with new savoury delights that are inspired by Cantonese-style cuisine. Instead of a roasted turkey, try the Soy-braised Turkey served with Toasted Spiced Almonds and Homemade Chilli Sauce ($238) that is good for a party of 12. Slow-cooked for no less than two hours with spices such as cinnamon, cloves, star anise as well as dark and light soy sauces; the turkey is served with a choice of Pumpkin Rice or Egg Noodles in Soy Sauce with Blanched Seasonal Vegetables. For dessert, indulge in creamy durian goodness within layers of vanilla sponge with the Goodwood ‘Mao Shan Wang’ Durian Christmas Log Cake ($75 for 500g); which is a premium adaption of the signature Goodwood D24 durian Christmas log cake. A 1kg option is also available at $80. In addition, the popular D24 Durian Puffs are also available during the season at $45 for 10 pieces, along with D24 Ice Cream and ‘Mao Shan Wang’ Ice Cream tubs at $20 and $29 respectively. Available for pre-order at: The Deli at Goodwood Park Hotel and via the Christmas Call Centre at 6730 1867. 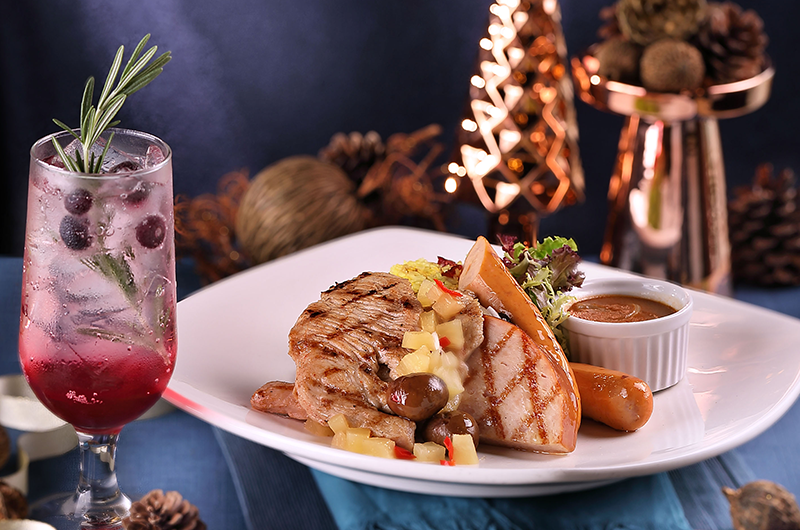 Get festive feasting at Marina Mandarin with the family! From now to 30 December, enjoy a festive-themed buffet which features mouth-watering specials like the Chargrilled Black Angus Beef Prime Ribs with Herb Sabayon, Norwegian Halibut in Crustacean Bisque and Lemon Risoni, Roasted Festive Turkey with Rosemary Infused Maple Glaze as well as the Matcha Sesame Christmas Log Cake. Alternatively, you can enjoy gourmet takeaways from now to 26 December, that are perfect for a cosy home celebration with your loved ones. 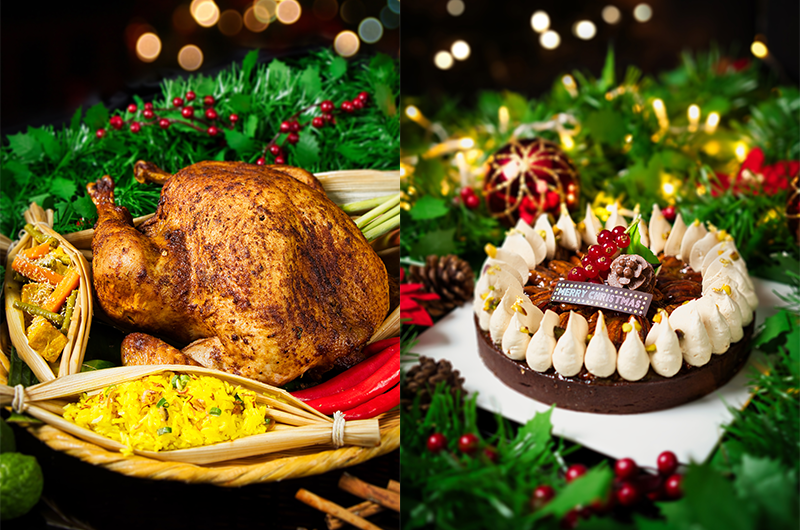 New items include the Erdinger Roasted Whole Turkey and the Southeast Asian Heritage Spiced Roasted Whole Turkey for the mains, while the Christmas cake family welcomes the addition of the Apple and Lime Bergamot Chocolate Yule Log, the Durian Mousse Yule Log and the Tropical Fruit Buche. Takeaway treats available for pre-order at: Café Mocha at Marina Mandarin and online here. Looking for a nice peaceful and relaxing place to enjoy your festive meal? Saltwater offers a delectable festive buffet that features traditional Christmas classics such as a carving station that serves roasted turkey breast and honey baked chicken with chestnut stuffing, as well as an impressive array of Asian and Singaporean local fare which includes Saltwater’s award-winning Nonya Laksa, Oxtail Stew, DIY Rojak, and Durian Pengat Shooters. Good for a Christmas gathering without the kids; Atmosphere Bistro presents a merry feast that tastes and looks visually stunning. 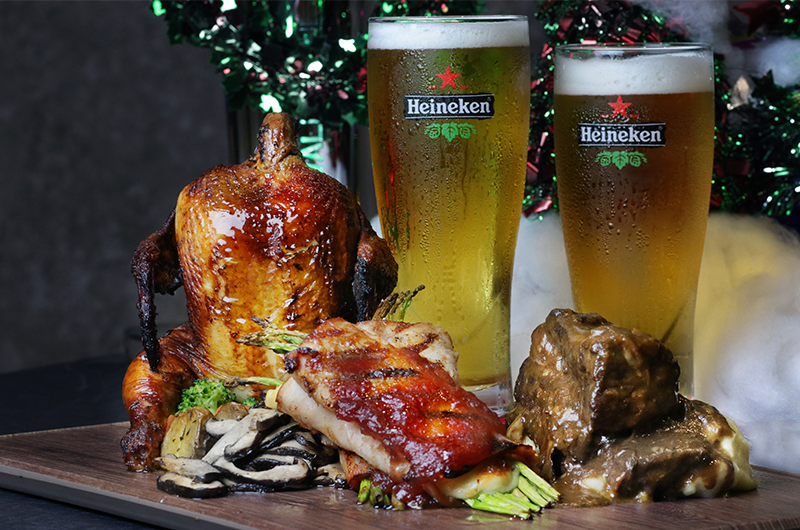 The Flaming Carnivore Platter ($88) comes with the star item which is a whole roasted chicken doused in whiskey, and set aflame to create a mind-blowing crisp on the outside while maintaining a tender meat texture. The platter will also come with mozzarella enveloped in a smoked Turkey breast roll, braised short ribs, creamy mashed potatoes and sautéed seasonal greens. *Closing time is subjected to change when there are LIVE Sport Screenings. 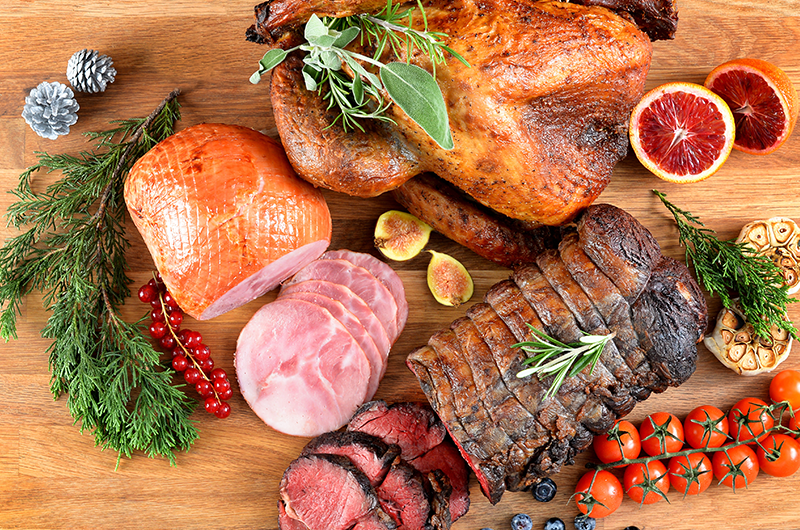 Plan a wholesome feast this festive season with a table of premium roasts from Ryan’s Grocery. As one of the most comprehensive organic butchery and grocery stores in Singapore, the grocery delivers a full-service butchery with free-range, certified organic, premium meats such as beef, lamb, pork and chicken. This Christmas, choose from a wider selection of raw and roasts which includes the Organic Diestel Turkey, several cuts of Organic Black Angus Beef, Organic Saltbush Boneless Dorper Lamb Leg and Australian Lamb Rack, Borrowdale Pork and an assortment of sausages. Two Christmas Meat Sets are also available for order with reheating instructions provided. Available for pre-order at: Ryan’s Grocery and online here. 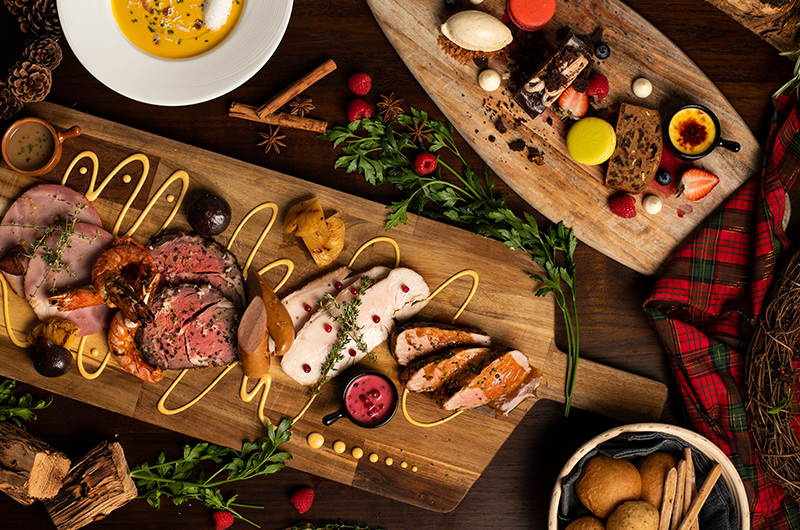 In their inaugural Christmas feast celebration, House of MU presents a festive three-course menu designed by head chef Tyrrell Joon, which includes the restaurant’s signature dishes and Josper-grilled meats. The meal begins with either the Linguine Vongole, Truffle Cream Risotto with Pan-Seared Crayfish or a hearty Cream of Pumpkin Soup with Freshly Baked Bread. The main course brings together an enormous offering of six Josper-grilled meats and seafood served alongside roasted baby potatoes, cranberry and black pepper sauce. To end your meal on a sweet note; you can choose to have either a slice of Pastry Chef Pang’s Christmas log cake or brandied fruitcake. If you’re looking for a log cake to take home, try Chef Pang’s Chendol Log Cake ($48) which is inspired by the iconic local dessert and crafted using a chendol jelly-pudding made from mung bean flour and pandan leaves for the centre of the cake. Complemented with a base of mango mousse and finished with passionfruit glaze; it is a sweet combination of western tradition and Asian flavour! Gather the family for a truly Singaporean Christmas meal at SPRMRKT. Available as a takeaway or dine-in option, enjoy the new Claypot Rice Roast Turkey ($128+) which is an East-meets-West interpretation of the quintessential Christmas turkey that has been generously stuffed with fragrant claypot rice, lap cheong (Chinese waxed sausage), shiitake mushrooms and salted fish. Those looking for the classics need not worry as the Traditional Roast Turkey ($128+) is also available with two equally delectable types of stuffing. All turkeys are served with their house-made turkey jus and cranberry sauce on the side. Mums and dads, remember to leave room for the desserts that have been prepared for the adults to enjoy on this festive occasion. Soaked with eggnog and baked with a buttery pastry top; the decadent Eggnog Bread Pudding ($38+) is finished with a rich eggnog anglaise for a sweet, boozy kick. For something less indulgent; opt for the limited-edition Christmas Chiffon Cake ($86+) which is a moist, bourbon-infused chocolate chiffon that is coated with coconut shavings and expertly decorated with white chocolate matcha Christmas tree toppers. Spread the holiday cheer at home with beautiful carveries and desserts from Dean & Deluca. Lovingly handmade by their team of chefs, enjoy festive traditional meals that come with either a traditional roasted turkey, slow-roasted beef ribeye, Moroccan-spiced boneless lamb leg or maple and clove glazed ham alongside a selection of two festive sides for $120. Finish your meal with a sweet Christmas treat that comes in two festive flavours; the Macadamia Chocolate Log Cake with Red Velvet Sponge or the Rum and Raisin Log cake ($88 each).